Brewers use spring seasonals to audition innovative beers. Spring seasonals like Samuel Adams Cold Snap offer consumers an alternative to the heavy ales of winter and a transition into summer. Winter may mean snow and ice for the northern half of the country, but in the world of seasonal craft beer, spring has begun. Typically launched in January, spring beers have the poorest sales performance of the seasonals, but brewers say that’s no reason to ignore the opportunities they offer. Craft beer producers often use spring to come up with interesting and innovative brews. Beer drinkers have become accustomed to expecting certain products during the year. The end of summer brings pumpkin beers and malty Oktoberfest brews. Winter and the holiday season highlight darker, flavorful beers, and when the days are warm, drinkers can choose from a wide selection of lighter summer beers. But there are no expectations with spring beer styles, which may be part of the reason for sluggish sales. Craft beer sales dip during the first three months of the year, rebounding just as summer beers hit the shelves, according to Nielsen Scantrack data. Samuel Adams has changed its spring seasonal offering several times over the decades, starting with a double bock in 1988. Last year, Samuel Adams replaced its Alpine Spring unfiltered lager with the Belgian-style white ale Cold Snap. 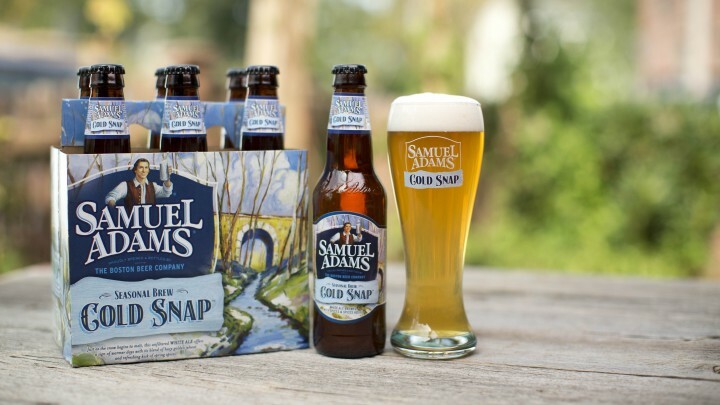 Sold nationwide from January through mid-March, Cold Snap is available on draft, in 12-ounce cans and bottles in six-packs ($7.99 to $9.99, depending on the market) and 12-packs ($14.99 to $17.99), and as part of the Samuel Adams Spring Thaw Variety 12-pack ($14.99 to $17.99). This year, Widmer replaced its spring seasonal Columbia Common with Hopside Down. As the name suggests, the brew is a “more hops-forward style of beer,” Walen says. It’s brewed like an IPA, but with lager hops for a lighter finish. Sold in 12-ounce bottles until mid-April in six-packs ($8.99) and variety 12-packs ($13.99), Hopside Down comes in at 6.6-percent alcohol-by-volume (abv). The brew aims to attract the growing number of consumers who prefer hoppier beer styles. Salt Lake City, Utah–based Uinta Brewing Co. takes a more unique approach with their seasonals, staggering the release of four distinct beers throughout the early part of the year. From December through March, Uinta sells its Yard Sale winter lager, part of the Classic Line, in 12-ounce bottles and cans ($9 a six-pack; $18 a 12-pack). From February to April, Uinta offers Hyve honey ale, the spring seasonal in its Organic Line. Sold in 12-ounce bottles ($9 a six-pack), Hyve is the company’s beer for transitioning from snow to summer. Uinta has two additional spring beers in 750-ml. bottles as part of its Crooked Line: the smoky-flavored Tinder rauchbier ($9) in January and February and the Birthday Suit sour brown ale ($12) in March and April.